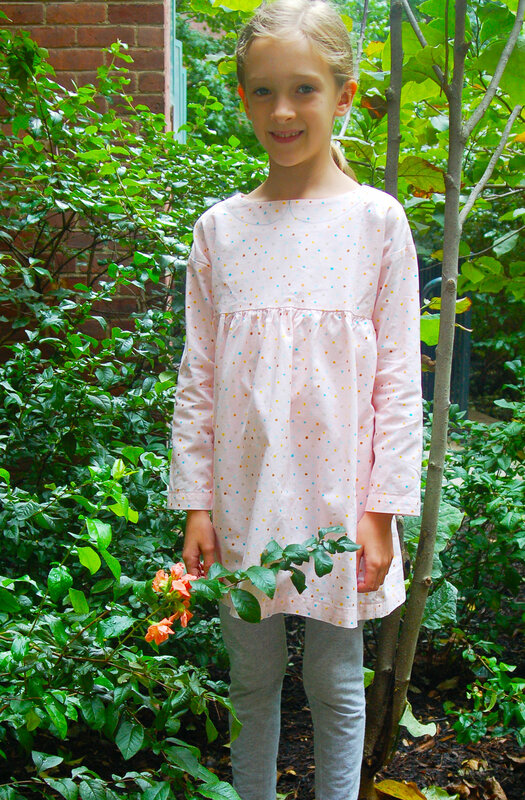 I’m so pleased to introduce you to the third of our new fall patterns, the Playtime Dress, Tunic + Leggings. This is a really easy pattern that’s also extremely versatile. Leggings are such a useful wardrobe basic, and these sew up really quickly since they’re made with just one pattern piece. You’ll want to use knit fabrics with at least 25% stretch so you get a good fit and so they’ll have plenty of stretch to them, for comfort and lots of movement. S tested out these patterns during our trip this summer and loved them. She wore the heather gray cotton jersey leggings all over the place (including to sleep, since I completely forgot to pack her PJs), and the tunic looked great with jeans and skirts as well as with the leggings. 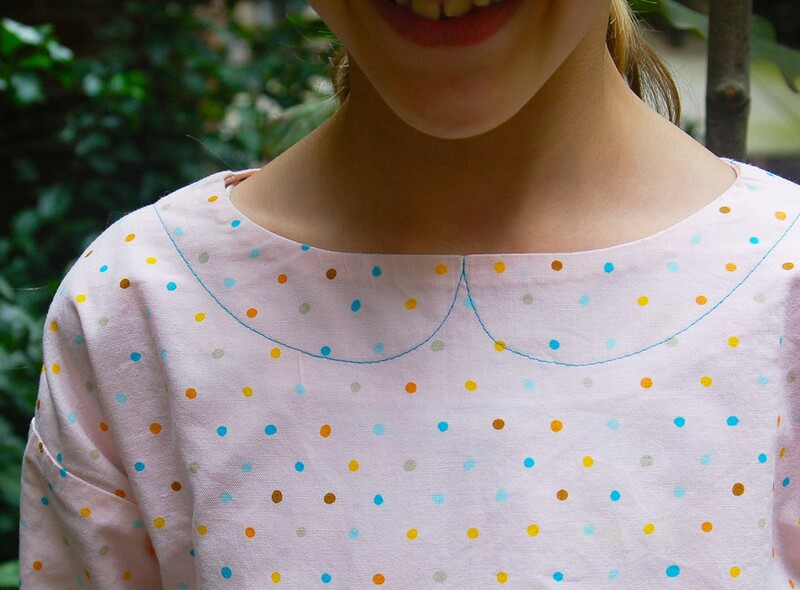 S’s tunic is a pastel polka dot print (from Jay McCarroll, I think? ), and we use bright turquoise topstitching at the stitched collar and pocket to highlight the lines and to coordinate with the colors of the print. We also made S a cozy pink French terry version of the dress, which she’ll wear this fall when the weather turns cooler. I think this one will be really wonderful during those bitter cold winter days; it’s almost like wearing a blanket! 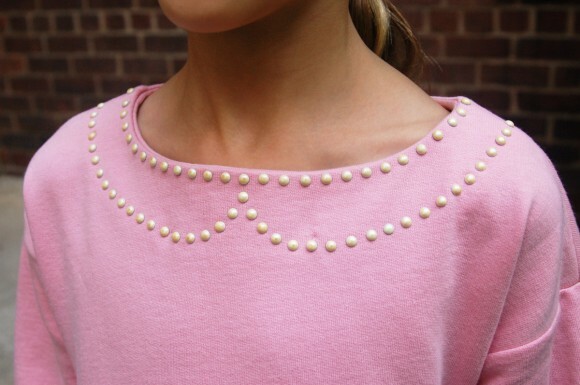 We had such a lot of fun with the dress, embellishing the faux collar with heat-set pearls to highlight the shape. It’s similar to some of the jeweled collars that are so popular right now. I think those topstitched details on the pattern will be great with other sorts of trim to highlight them, too. I’ve cut out another version of the tunic in a cream-colored French terry and plan to add black trim to the faux collar and pockets, just for the fun of it. This pattern is one of those styles that we refer to as a wardrobe basic, and these pieces are great because they’re appropriate for everyone from the littlest babies to the big kids. I like the pattern because all of these pieces are really comfortable and casual, and they look great in a wide variety of fabrics. I hope you’ll have fun with this style and it will become a wardrobe basic at your house! We’ll have this, and our other new patterns, available for sale on the website tomorrow! I have been looking for a similar Japanese pattern, but I’m pretty sure your instructions are way much better! And I love the final words (on sale tomorrow). Just in time for some weekend sewing! This is incredibly adorable! I love your patterns! That heat-set pearl faux collar is so fun! And all the new patterns are available tomorrow? Woohoo! I Love Love all your patterns. I have 2 no 3 little granddaughters. Ages 5,4 & 6 months. Can’t wait for the new patterns to release. SO excited for this one. That topstitched “collar” is genius. I am going to make a million of these. And just one pattern piece for the leggings? SOLD! Love this! I think I can even sneak in some school uniforms with this pattern! This one is adorable. Cheers!!! Beyond excited for this one. I foresee about a dozen of these outfits in my future. Completely love the faux pearls!!! Love this ! What’s the difference between a kimono sleeve and a set in sleeve? This is so cute! A really good go-to and I would love a better leggings pattern (than the one I drafted myself ;)). Super cute! I love the sweet neckline detail. Just confirming the pink polka dots are Jay McCarroll. Great basic pattern! Ooooh, those heat-set faux pearls: GENIUS!! And the cream / black combination sounds like a winner too!! Dear Liesl and all the hardworking team at O + S; all your new season patterns are just marvellous!!! Thank you so very much. Although we in the antipodes are heading into spring/summer, your new designs will be perfect for children here, now. Playtime is a wonderful staple item, and as you say will be a go-to for everybody, all year round. Wonderful!! where can I find the jersey stretch fabric? I love this one! I spotted the pink tunic on S in your trip pictures and hoped it was one of the new patterns! I’ve been looking for a pattern like this for years! My younger daughter is now 11 years old, but I still think she’ll get a lot of use out of it with leggings, pants and skirts. Thank you for another great pattern! I would love to make this dress for my grandaughters in England and New Zealand, but I live in Fiji! Is it possible I can purchase the pattern and have it posted to me if I give you all the details? Absolutely. Just complete your order on our site. Alternately, you can purchase a digital copy of the pattern which you can download and print at home. Juliana, I tacked down the facing at the shoulders for the fleece version because I didn’t want the topstitching to interfere with the pearls. I might also use a little Mistyfuse to hold the facing at the front, just to keep it from moving when the dress is worn. I hope that helps! I’m about to do some do handicrafts for my niece. And your blog here is a perfect illustration and inspiration for me to do that. I hope she will appreciate my working time and will enjoy in wearing my future clothing 😀 But for that please answer my following question: how do you fixed the pearls? Are they glued? needled ? How do you did that? We used heat-set pearls for that version of the Playtime Dress.